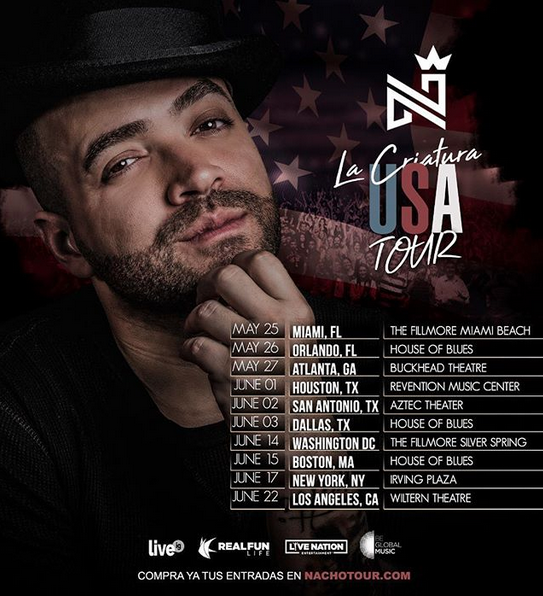 Nacho Announces La Criatura USA Tour! Nacho is touring the U.S. this spring and we can't wait! The beloved Venezuelan singer and songwriter, who is nominated in two categories for the Billboard Latin Music Awards this year, is continuing to successfully build his solo career after he and long-time musical partner Chyno Miranda split in 2017. Among the success of numerous collaborations with fellow Latin artists like Justin Quiles, Feid, and Da Soul (as well as an infectious smile-inducing music video with three of his sons), Nacho's solo singles "Baílame" and "No Te Vas" have become immediate hits and have racked up millions and millions of views. Nacho will bring his La Criatura USA tour through major U.S. cities like New York City, Miami, and Washington, D.C this spring. Get tickets here and check out his latest single "No Te Vas" here.